Much in the same way as Apple sparked a revolution on the smartphone market, Samsung essentially started a whole separate category within the industry with the original phablet – the 2011 Galaxy Note. While rivalry has always raged between the two manufacturers, we've often felt like they're waging a kind of a proxy war, and basically compete indirectly in a way. In other words, there was always a major differentiating factor (size, operating system, underlying philosophy) between their devices, and that, in a sense, instilled a feeling that theirs was more of a game of who's gonna get the farthest the fastest, and not who's going to make it out of the cage alive. But no longer. 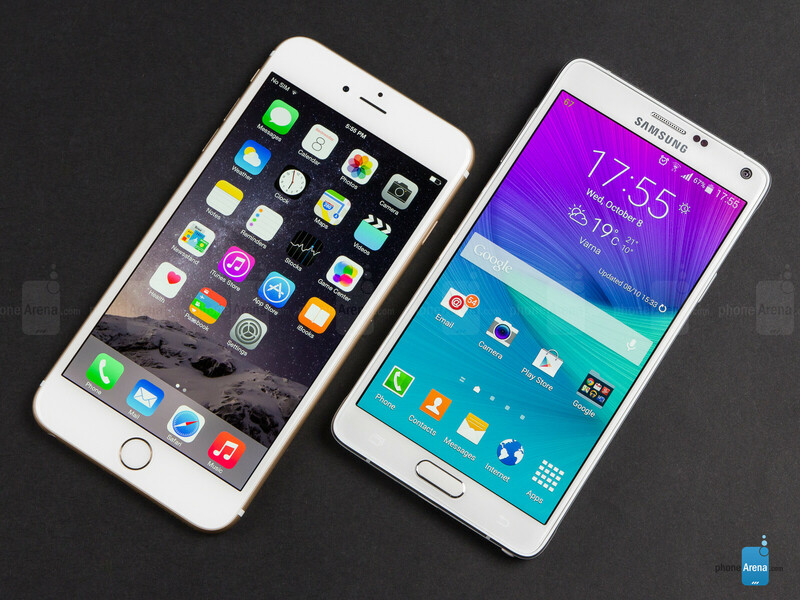 Phablet lovers will adore these two. With the Note 4, Samsung is finally transitioning towards different materials, and the phablet is seen sporting a chamfered metal frame that feels great in the hand. At the back, we're once again looking at a polycarbonate imitation of leather, though the texture has been changed to a slightly less grippy one, which, however, looks more authentic than the one available with the Note 3. In comparison, Apple has endowed the iPhone 6 Plus with an all-aluminum body and plastic is altogether missing – front or back. The Note 4 is also different at the sides – the overall shape is still of a rectangular that is pleasantly rounded at the edges, but Samsung has actually implemented shock-absorbent bumps at the four corners of the device, much alike to the Galaxy Alpha. The iPhone 6 Plus – also a rounded rectangle (if slightly more so) – doesn't feature protective bumps, and is instead making use of a circular, tube-like frame that hugs your palm nicely. All in all, we've gotta hand it to Apple – when it comes to the feeling you get when handling the two devices, the iPhone 6 Plus definitely inspires a greater sense of you toying with something truly high-end. 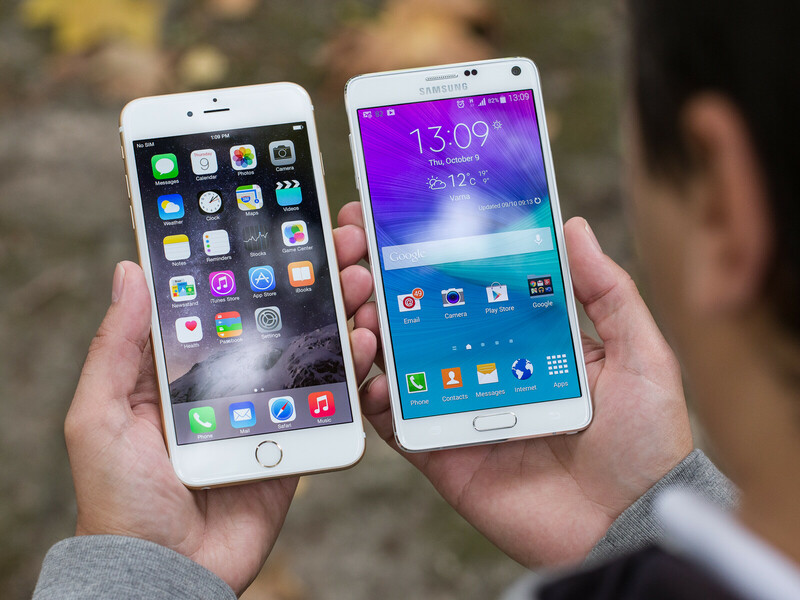 Unfortunately, while it is the slightly narrower device, the 6 Plus is still plenty big. 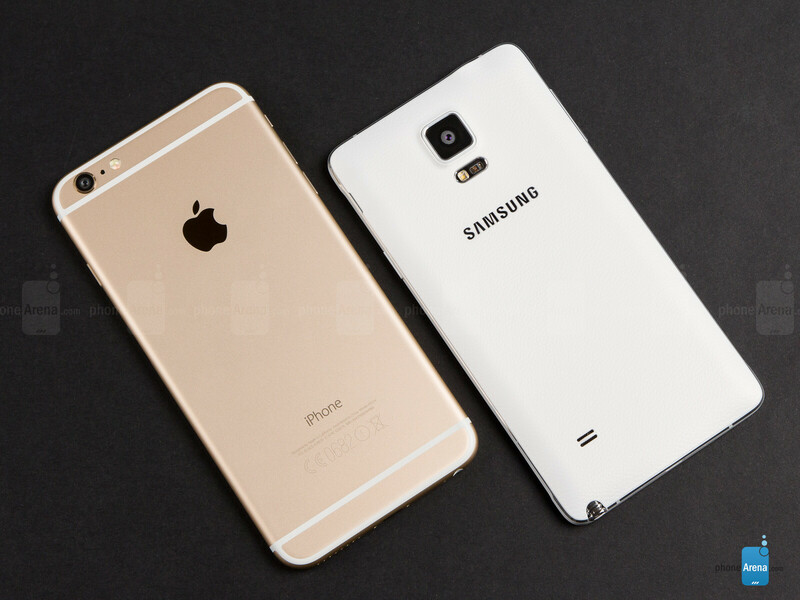 So big, in fact, that it towers above the Note 4, despite its smaller, 5.5-inch screen. In any case, we're still looking at two XL-sized smartphones, both of which are simply not meant to be used with just one hand. Last, but not least, the Touch ID fingerprint scanner that debuted with the iPhone 5s can still be found embedded within the circular home button, and it's just as reliable and easy-to-use. We've got to say that we still prefer it over the swipe-type fingerprint scanner on the Note 4 (also a part of its home button), even though that one has seen some improvements from the frustrating early days of the Galaxy S5. 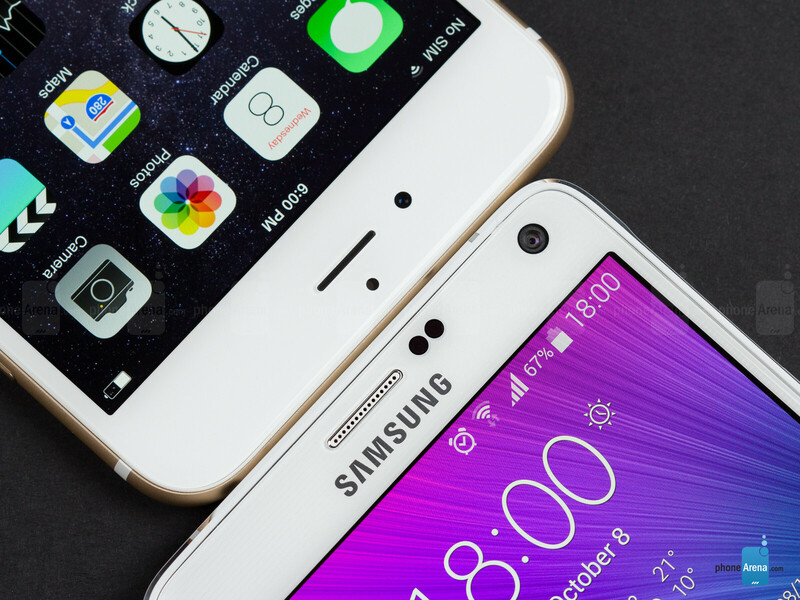 A Samsung Super AMOLED panel that offers a better color fidelity than an Apple IPS screen? Better believe it! While Samsung has been gradually increasing the display size of its Note devices with each successive generation, this trend has been put to an expected stop with the Note 4, which shares a 5.7-inch diagonal with its predecessor. What did change, however, is the screen resolution – the number of pixels shot up by 77% to 1440x2560 (Quad HD), so the Super AMOLED panel on-board now boasts the whopping 515 pixels per inch. The iPhone 6 Plus, in turn, sticks to a smaller, 5.5-inch IPS display with a conventional 1080x1920 resolution, or a pixel density of 401 ppi. On paper, the difference in resolutions is non-trivial and very much in favor of the Note 4, but in real life, bragging rights are the biggest benefit of having all these extra pixels. When the two handsets are held at a normal distance from the user's eyes, the difference in screen resolution becomes indiscernible. We went in-depth with the Galaxy Note 4's screen, and found that the new panel is the very best we've seen from Samsung. The display's color temperature is excellent at 6667 K – an absolutely negligible deviation from the optimal value of 6500 K – beating the iPhone 6 Plus' 7300 K, which causes a slight bluish overcast. But that's not all – this is actually the first phone with an AMOLED screen that is as faithful in rendering hues properly – color error is pretty small in Basic mode, and grayscale errors are also fairly low. The average color error on the iPhone 6 Plus is also decently-low, but colors are not quite as on-target as the ones available with the Note 4's display. The only downside to the Note 4's panel is its gamma value of 1.97, which is below the reference value of 2.2 – the iPhone 6 Plus is close to perfect, at 2.18. In practice, the lower gamma of the Note 4 is the result of brighter highlights only, with the shadows remaining as dark as they should be. This means that the screen ends up being a bit punchier and more contrasty than normal, though the effect is not so overdone as to be annoying or distracting. Moving on, the brightness of the Note 4's screen is good, at 468 nits, while the one of the 6 Plus is excellent at 574 nits. However, outdoor visibility in broad daylight is very good on both, as the two of them sport very good and non-reflective glasses. The Note 4's display can be dimmed down all the way to 1 nit, which is outstanding and guarantees comfy usage in your bed, while the iPhone 6 Plus can do 4 nits, which is also excellent. One last advantage of the Note 4's screen is its ability to become highly-sensitive, allowing you to use it even with gloves – a great feature in light of the coming winter. Yup. but as a true power user it should be note4 all the way. I wish more people would recognize the incredible usefulness of USB OTG. This allows phones like the Note 3 and 4, S5, LG G2 and G3 and maybe a few others to use a hub plugged into the Micro USB port, which has a full-size USB port, Micro SD and full size SD ports. This gives the phone full control over a thumb drive or SD card. As a photographer, this has been incredibly useful in the field on my G2. iPhones need to get on this sort of connectivity. I believe that would be the camera connectivity adapter if I'm not mistaken. Yep, 2 days of usage easily. If battery usage is a concern. Go for Z3 Compact. Screen is too small for me. Battery is not a problem for me. I can easily go two days on a full charge with no problem. I think not too long ago, IPhone 5S had the most practical and sensible screen size in the market. (according to Apple & Apple Fanboys). Maybe Apple thinks users have became impractical and non-sensible. I've been using big devices since last year with the Note 3, so it made sense to jump to iOS 8 with the 6+. Good luck with that. let me know how your phone looks after 6 months of being in your pocket. i hope you like the bent phone look. Fits on the side of my waist perfectly with my case + clip combo. Stay mad my friend. Mad? Why would he be mad? He is getting the best phone. Your the one that will be mad. Good luck with all the trouble IOS is having. 8.0 back to 7.0, then up to 8.1 within a month. Security problems. Nothing you can fix or change on apple without going to repair shop. Battery, memory. Oh yea, make sure you buy the right memory on phone or apple will get your money on cloud too, Which also cost and is using data to upload and download and slower too. Yea, you'll be mad or you just don't know any better. Most fanboys don't though! Had the phone for over a month now (the 6plus) and I've had no issues at all. Switched from Galaxy s4 and totally happy with it. oh jeeze. you really believe thats going to happen cause you saw a guy bend it with two hands? thats just silly. That's a little overblown about the bent case. Out of the tens of millions sold, less than 1,000 have surfaced and I'm sure most of them were from idiots that were purposely TRYING to bend the phone to get attention. People don't normally TRY to break something they bought unless they are some stupid YouTUbe product reviewer trying to get lots of views. If someone is that worried about it, they can certainly get a case that will prevent any sort of bending or just simply not sit on it by having skinny pants. Some people are going to break their phone due to carelessness and some don't. My last iPhone lasted almost 3 years and there was NOTHING wrong with it. Never had to replace the battery, never cracked a screen, never bent or cracked a case, the thing was near flawless when I sent it back for a trade in towards my new iPhone. I'll stick with iPhones because I don't want to have to deal with another company. I use OS X and iOS for tablets and smartphones and I understand the benefit of having one company that actually answers their tech support line and helps out when/if I have an issue. No company is perfect, but at least Apple provides yearly OS updates, timely updates for security/bug fixes and I get them the day they release them and they typically have 4 years of usage whereas most Android phones only get about 2 years worth of OS updates, they aren't released in a timely manner, there are too many malware problems and the UI is just too complicated for a mobile device with Android and there is no consistency on that platform and I just don't like anything that Google puts on the market. It think they are a scatterbrained company with no clear idea of what they are doing and it reflects in their products/OS. That's fake. The phone actually does not bend. It's Photoshop and time lapse over many, many hours of HIGH PRESSURE. Not the average walkaround with it in your pocket. How does that make sense? When you make the jump from the Note 3 to 6Plus....there is a paradigm shift. 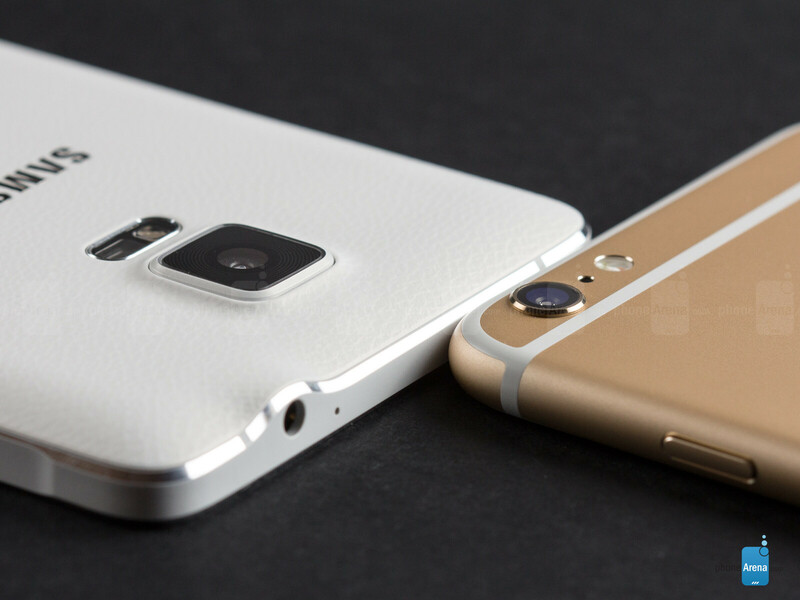 Note 3 to Note 4 is understandable, iP5s to iP6+ is also digestible....but Note 3 to 6+?? And this review isn't credible....In the conclusion it sounds as if the reviewer is taking Samsung to task and it seems as if Sammy is the brand that has the onus of producing a good phablet as ifg Apple had set previous benchmarks in this field! Oh wait....WHAT? That wasn't Apple....it was Samsung! And the onus is on Apple to deliver a phablet that can reach up to Sammy's Note benchmark. Apple has a decent start....I'll give it that but Please nowhere near the Note line....not by a long shot! I've run into a lot of Note 3 users that switched to 6+s and they were totally glad they switched. A lot of it was the thickness, but they really just liked the OS better. There are 3 possibilities, 1) you are not saying the truth, 2) You have run into a lot of crazy people, 3) You mixed up the sequence from iphone 6+ to Note 3 to Note3 to iphone 6+ (typo mix). reading all of the polls in different web sites proves this. Samsung Note series especially Note4 wins in all categories by a mile!!! Actually, I have an iphone 4, I love the 5's screensize and really dislike both new phones so I'm switching to a Z3 compact, I think the screensize really affects the user experience and the ways it can be handled, also, smaller phone means a better grip. Here's the problem. iPhone users typically want to use their phone comfortably with one hand. Apple kind of figured out how to make a larger screen work with one handed operation and it's a combination of their one handed feature AND the case size. Obviously, I'm glad Apple waited another year because I don't think the A7 with these larger screens would have been fast enough. It wasn't until the end of last year did Apple actually finalize the screen sizes. They were apparently playing around with a bunch of different screen sizes as Apple kind of likes to stick with one size for a period of time as changing screen sizes can create problems for developers developing apps that are written for different screen sizes. But to give you a little hint. I always wanted a larger screen size and I originally wanted about a 4.5 inch, but the 4.7 inch is perfect. Any larger than that and I don't know if I would like it. Maybe 5inch is about the largest I would want. But being able to hold it comfortably and use one handed operation is a good thing and the Android phones aren't as good because they are either too thick of a case and they don't have that one handed feature in the OS. Apple doesn't use a stylus because that's the whole premise behind the iPhone in the first place. Obviously you forgot that memo. And let everyone know when Android finally gets to 64 Bit processing. So far, it's only 32 Bit, Oh, wait, you have to wait until 64 Bit processors come out next year. Move along Android. Apple doesn't want to make clunky over bloated OSs with so many features, you end up not using the product. I know plenty of Android users switching back to iPhone and the only reason they went with Android in the first place was the large screen and that was it. Other than that, they prefer the iPhone. Sony just can't play with the big boys when it comes to carrier support. People scream how good Sony is but when you're not on the nation's largest carrier like Verizon it's pretty hard to take you serious. Shame because the Z3 compact is a nice phone; it's just a phone that I can't own. I won't jump carriers because of a single device.